There are certain moments in life when I have difficulties describing my emotions. The moment when I stood in front of the A-Bomb Dome was one of those. Sadness, anger, fear, but also hope. A truly memorable day. Here’s how you can visit Hiroshima and Miyajima in one day from Kyoto and why both places are worth visiting. How to get from Kyoto to Hiroshima? This is an easy exercise. 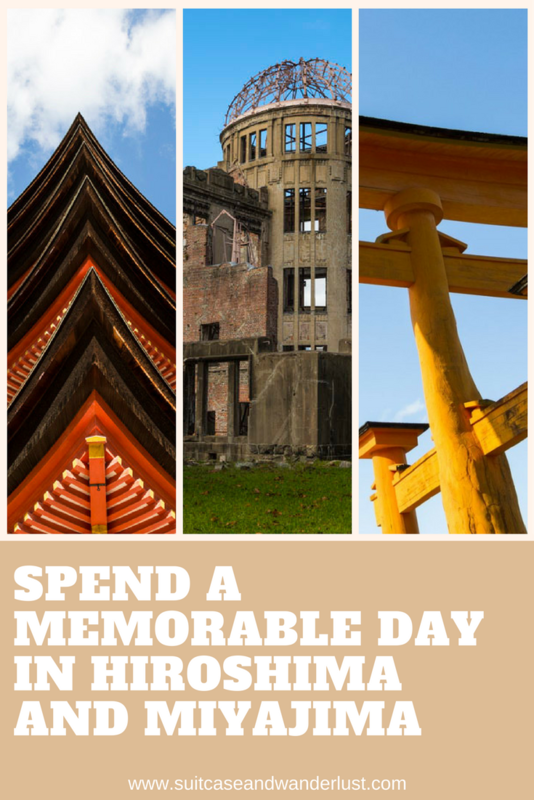 Just hop on a Shinkansen Sakura to Shin-Osaka or Shin-Kobe and change to a Shinkansen bound to Hiroshima or take the Hikari which brings you straight to Hiroshima without transfer. The fare is around 11.000 Yen or it’s free with the JR Pass and the journey takes around two hours if you take the Sakura or Hikari Shinkansen. You’ll need longer if you’re using a Kodama Shinkansen. Use the Hyperdia online schedule to check times, trains and fares. Make sure to leave Kyoto as early as possible. I took the Hikari 392 at 8.00 am. How to get around in Hiroshima? When you arrive in Hiroshima, the easiest option to get around in the city is the hop-on-hop-off bus. The fare is 400 Yen for the day or free with the JR pass! You can choose between three routes and all of them cover 11 major tourist spots. I am a big architecture fan so my first stop lead me to Hiroshima castle. Located in a park and surrounded by a moat the five stories tall building looks majestic. I was blessed with sunshine and blue sky which underlined the beauty of the building. 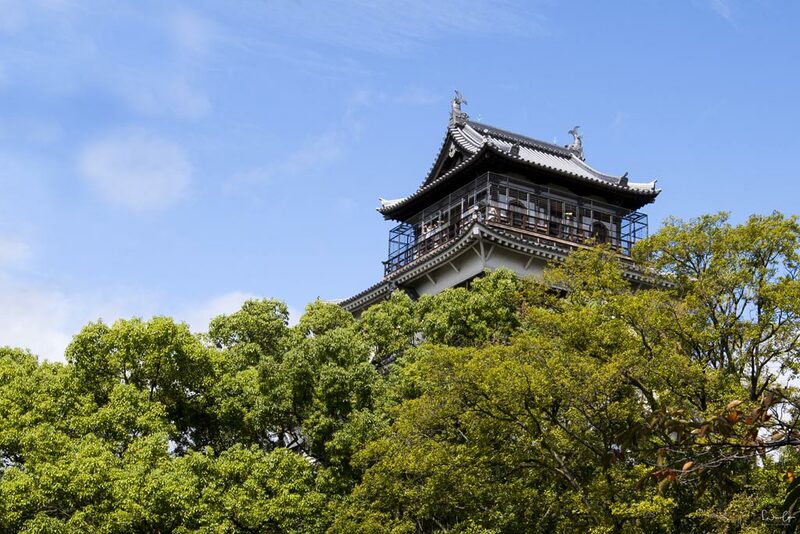 The castle was destroyed by the atomic bomb and rebuilt in 1958. Today it is a museum and from the top you have a breathtaking view of the surrounding area. Admission fee: 370 Yen. My next stop was the Hiroshima Peace Memorial or also known as A-Bomb Dome. 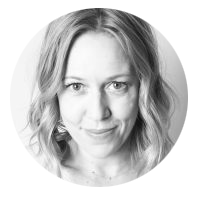 A shiver went down my spine and the emotional rollercoaster began: My feelings were alternating between sadness, anger, thoughtfulness, intangibility. While the city surrounding the dome is vibrant and lively, the memorial is a quiet place. No one is speaking and it nearly seems, the world stands still for the moments while everyone is in thoughts. A brief history brush-up: During the Pacific War, which was the Pacific and East Asia theater of World War II, the US dropped the world’s first atomic bomb on Japan. Hiroshima was hit at 8.15 am on August 9th in 1945 by devastating „Little Boy“. The bomb killed approximately 80.000 people instantly and another 60.000 by the end of the same year due to the effects of the bomb. The bomb exploded around 600 meters above and 160 meters southeast of the Hiroshima Prefectural Commercial Exhibition Hall with its distinctive green dome. Some main walls and the iron frame of the dome remained standing and are today known as the A-Bomb Dome. Throughout the years, many discussions followed whether or not to keep the structure. Many people wanted to destroy it and with it bury the painful memories. However, the voices to preserve the dome have increased. Thanks to fundraising campaigns the construction work could be financed so that the dome looks like it did right after the bombing. In 1996 the A-Bomb Dome was registered on the UNESCO World Heritage List. It should function as a monument for peace but also the abolition of atomic weapons. To me, it is also a monument to the cruelty and inhumanity people are capable of. 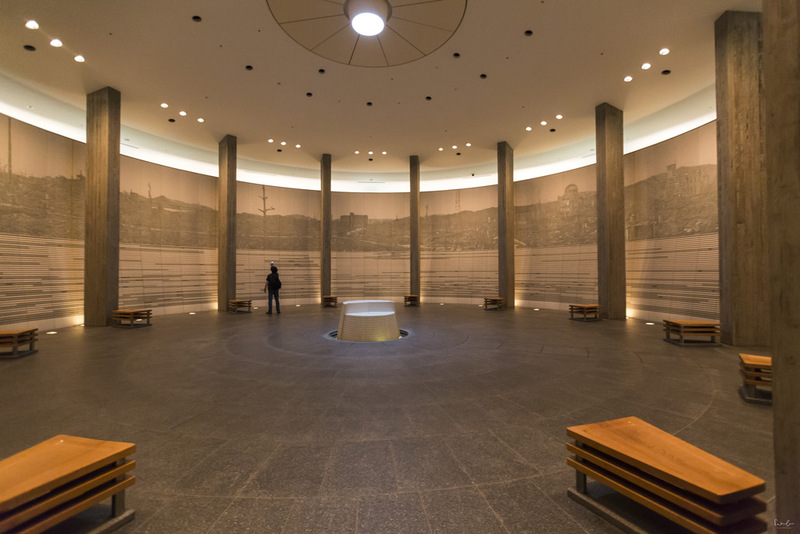 The Hiroshima National Peace Memorial Hall for the Atomic Bomb Victims is just a few meters away from the Dome and worth a visit, too. Dim lights lead you down the walkway into the circular Memorial Hall with approximately 140.000 tiles representing the number of A-bomb death victims by the end of 1945. On the wall, you see the view of the city as seen from the hypocenter, the former Shima Hospital. The basin indicates the time of the bombing. It should be a symbol for the dying victims who were craving for water. 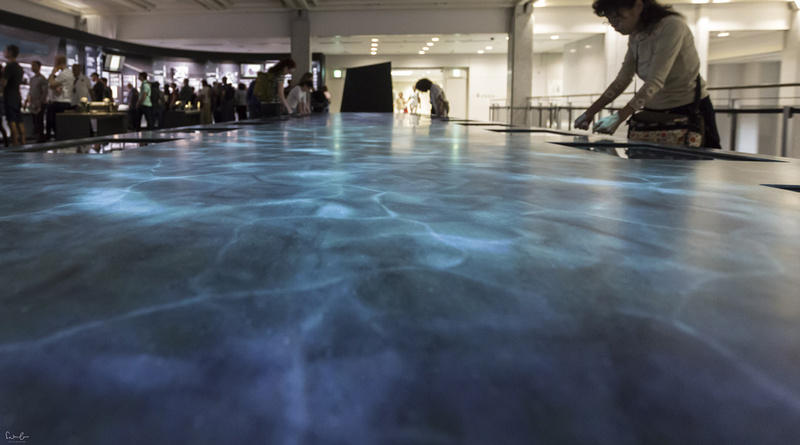 I also recommend you to walk through the Hiroshima Peace Memorial Museum. It shows the history of Hiroshima by photos and films and tells why the city was chosen to be bombed. You will learn more background information on the war and how it came to the bombing. It also presents how an A-bomb works and shows the devastation. Even if the visit of the atomic bomb sites is not a fun thing to do, I definitely recommend it to everyone traveling to Japan. I think we can manage to bear a little bit of sadness while we are shown what happened in the past and what should remind us to not want anything close to that to happen in the future. After the museum, I had two options: exploring the city of Hiroshima or heading to Miyajima. 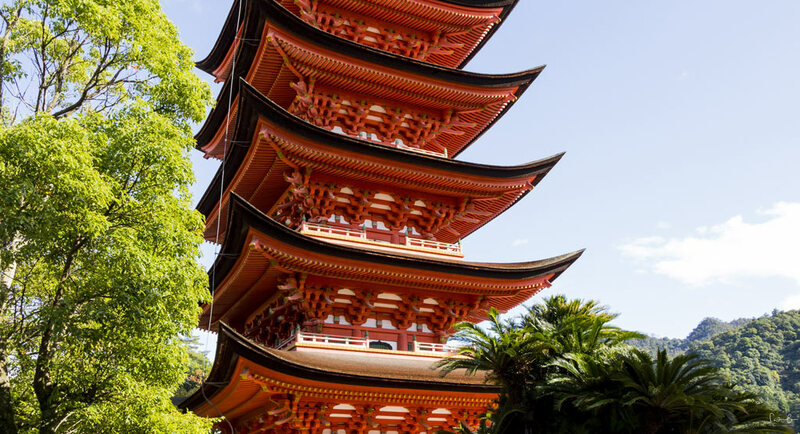 You can do both Hiroshima and Miyajima in one day from Kyoto as long as you leave from Kyoto in the morning and don’t spend too much time at one place. If you’re looking for some things to explore Kyoto, here are my recommendations. From Hiroshima Station take the JR Sanyo Line to Miyajimaguchi Station, then take the ferry to Miyajima Pier. The total travel time is approximately 50 minutes. Both, the train and the ferry are included in the JR pass. If you don’t have a JR pass, the fare is 590 Yen for one way. Miyajima is a small island in the Hiroshima Bay and famous for the giant Torii Gate right in front of Itsukushima Shrine. If you’re more flexible in terms of timing, you may want to get there when the tide is high so that it looks like the gate is floating. If the tide is low, which was the case when I arrived, there are hundreds of people gathering around the big gate. I’d preferred the high tide in order to capture the photo I wanted, however, it was nice to take a walk along the beach and watch the crowds taking selfies. 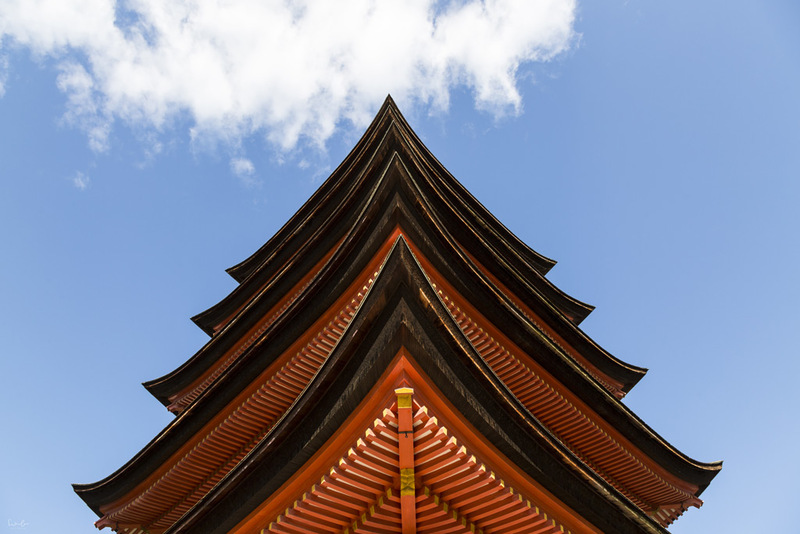 Just on the hill behind Itsukushima Shrine, there is a 27 meter high Five-storied pagoda from the 15th century. The design is really beautiful with lots of details and lovely decorative drawings. You can play with perspectives and take some unusual shots of the pagoda. Visiting Hiroshima and Miyajima in one day was a perfect combination. The emotional roller coaster you feel in Hiroshima and the relaxing atmosphere you find at the sea in Miyajima. 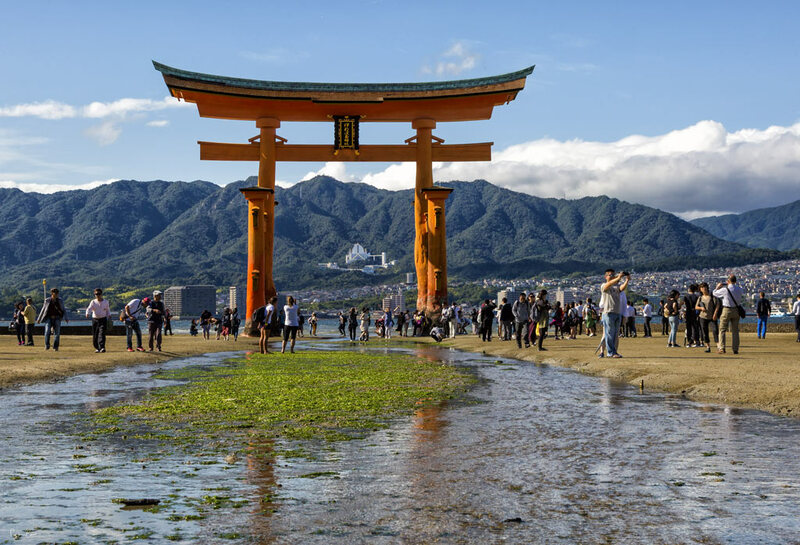 If you’d like to spend more time in Hiroshima to explore the vibrant city, you can also stay overnight in Miyajima and enjoy a wonderful sunset or sunrise at the Torii Gate. I got goosebumps from reading these! I think the feeling is similar to the one you get by visiting a concentration camp. I went to Auschwitz and was sick the entire day. The visit had an unexpected effect on my body. However, these places are about remembering those who died as a result from several events and paying honor to them. I know I have to visit Hiroshima one day. I’ve not visited a concentration camp yet, but yes, I think it might be a similar feeling. Thanks for sharing! I have visited world war two and genocide museums in the past. And yes, it might not always be fun but it is an important part of history, and it will often give you a better perspective of a city or a country. Thank you for your comment. I totally agree and I don’t consider it as a burden but a necessity to visit such sites. I did this same itinerary a few years ago, and I agree, it was a rollercoaster. I honestly needed something to cool down with after Hiroshima though. It is just such a powerful, tragic place. Miyajima was so perfect to recenter. Thank you for your comment. I only realized at the end of the day that it was the best idea to go to Miyajima afterward. Japan is definitely on my travel list, so I’ll definitely be pinning this for later – I always believe that its crucially important to see a country’s history, good or bad, before you can fully understand it. Thank you, Nicky. I hope it will be useful for your Japan trip. You will have a great time there. A timely reminder on this day 11.11.17 – we must always remember and as heartbreaking as it is to wander these places and see man’s inhumanity to man we must never forget. This type of piece resonates so much today thank you. Thank you, Faith. I totally agree with you. Agree – Hiroshima was quite emotional and moving, but I am so glad I went. 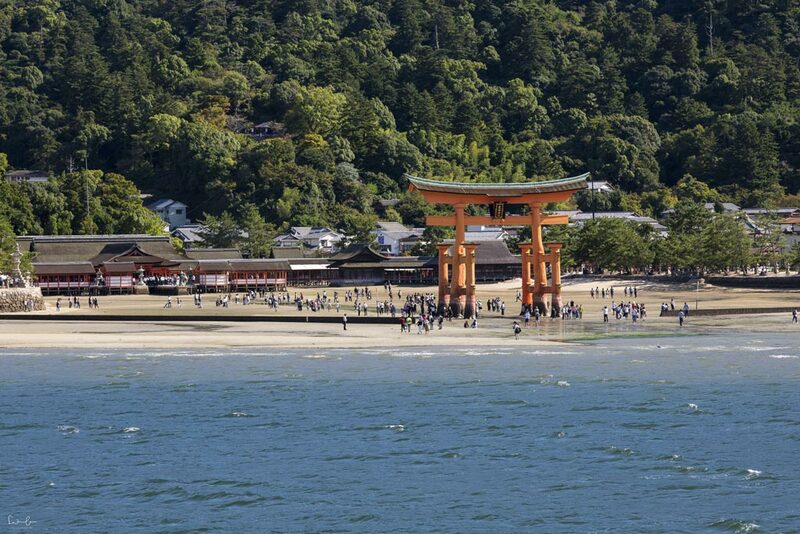 And Miyajima is amazing and a must-visit if you have enough time in Hiroshima. Me too! I didn’t want to go first but decided last minute. I’m glad I did! Thanks for your comment. To echo some of the other comments, I’ve been to Auschwitz and want to visit Hiroshima for the same reason – I think it’s so incredibly important to understand what humanity is capable of, and acknowledge that it must never happen again. I also agree that balancing out that sort of experience with somewhere like Miyajima is essential to keep us sane! Thanks so much for sharing. Thank you so much for your comment, Jill! I remember visiting Hiroshima with a group of fellow American students when I was in high school. The night before, I was more nervous than I’ve ever been to visit somewhere new because I was afraid that the people there would resent us for having been the ones to drop the atomic bomb there. Instead, I found some of the kindest, warmest people I’ve ever encountered in my travels. It was such a memorable day and I’ll never forget wandering through the memorial and taking in the eerie sight of the A-bomb dome. That’s beautiful. I’m glad your fear turned out to be in vain and you had a memorable day. I’m heading to Japan next summer and Hiroshima and Miyajima are definitely going to be on my itinerary. 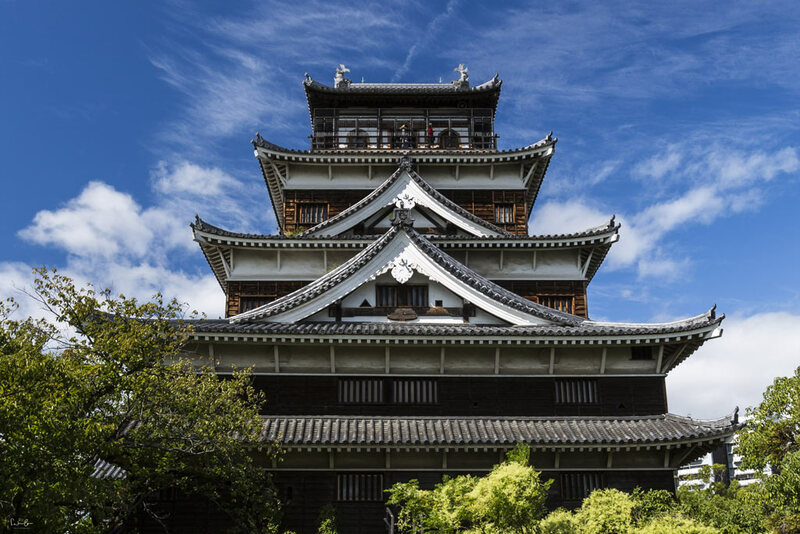 Hiroshima certainly sounds an emotional place, and the castle looks so beautiful. It’s also good to know that these places can be easily visited in one day from Kyoto! Bitter sweet memory.These are the moments that define us in life.Thank you for sharing your experience. Thank you for your comment, Verushka! Missing Hiroshima was my sole regret on our recent trip to Japan. We visited Miyajima, but due to train issues, completely missed exploring Hiroshima. I feel compelled to return and visit it – and I think you do a good job of presenting why it’s important to visit, despite the roller coaster of emotions people will feel. Maybe you’ve got the chance to go back. I think Japan is worth visiting at least a second time. Thanks for your comment. 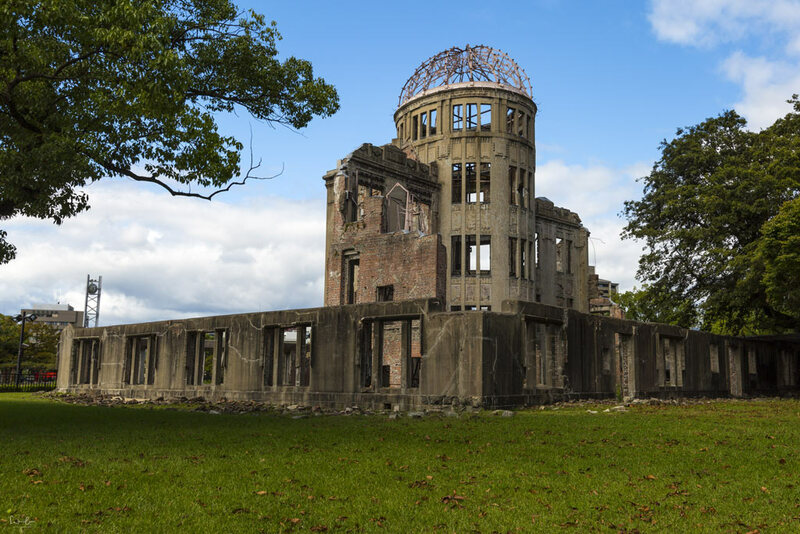 Visiting Hiroshima may be a very powerful and haunting experience. I felt completely different after visiting Chernobyl recently. Do I need a guided tour for there, Nicola? You don’t necessarily need a guided tour. There are books and folders at the dome and you can read a lot in the museum. It’s always more convenient to have a guide telling you all the details so that you don’t have to read but you can easily do this tour by yourself. Such an interesting read and place to visit. It’s a lot in one day but I sometimes believe it’s good for everyone to visit such sites where disasters happened. I did a lot of research on Dark Tourism during my studies and always find it so interesting. You shared some good advice, hope to go to Japan one day myself! Thank you very much for your comment. I hope you’ll make it to japan one day!